A skeleton uncovered at the site. The graves were uncovered at a site in Lincolnshire Wolds, a vast range of picturesque hills and swooping valleys located 132 miles north of London, England. The graves, of which there are at least 20, date back to the late fifth to mid sixth centuries AD, according to a University of Sheffield press release. A brooch found at the Anglo-Saxon cemetery. The first signs that something of archaeological significance was located at the site appeared when a local metal detectorist uncovered a number of Anglo-Saxon artifacts, such as spearheads, parts of iron shields, and copper-gilded brooches. An archaeological team, led by Hugh Willmott and Katie Hemer from the University of Sheffield, came in to investigate further. They were joined by Adam Daubney, the Lincolnshire Finds Liaison Officer for the Portable Antiquities Scheme. 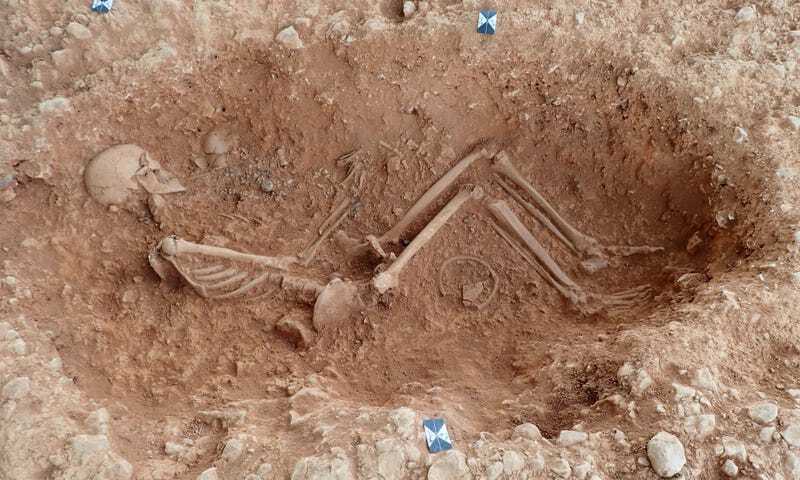 A female skeleton uncovered at the Anglo-Saxon cemetery. Naturally, the analysis will extend to the artifacts as well, including the amber beads. The archaeologists “will analyse the elemental composition of the metalwork and identify the elephant species which produced the ivory rings,” explained Hemer in the statement. Investigations at the site are still ongoing, so we should expect more from this remarkable Anglo-Saxon cemetery in the future. One thing’s clear, however—these ancient Englanders revered their dead, burying them with what were clearly very precious and rare artifacts.